31275 Features: -File drawer accommodates letter-size hanging file folders. -Number of drawers 3. 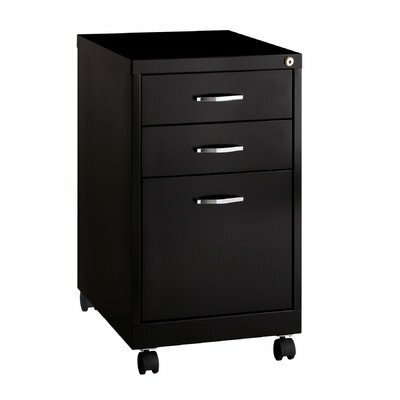 -Top drawers perfect for small supplies. Product Type: -Vertical filing cabinet. Finish: -Black. Style: -Contemporary. Locking: -Yes. Primary Material: -Metal. Commercial Use: -Yes. Wheels Included: -Yes. Drawers Included: -Yes. Number Of Drawers: -3. Drawer Type: -Letter. Dimensions: Overall Height - Top to Bottom: -26". Overall Width - Side to Side: -15". Overall Depth - Front to Back: -19". Overall Product Weight: -34 lbs. Assembly: Assembly Required: -Yes. If you have any questions about this product by CommClad, contact us by completing and submitting the form below. If you are looking for a specif part number, please include it with your message.